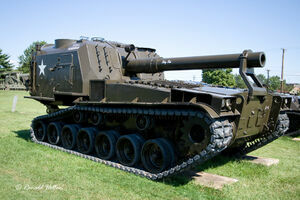 The M53/M55 is an American tier 9 self-propelled gun. 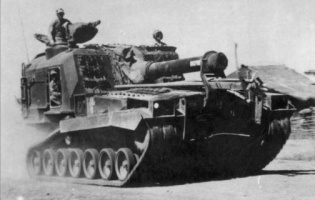 SPG on a modified chassis of the M47 medium tank. 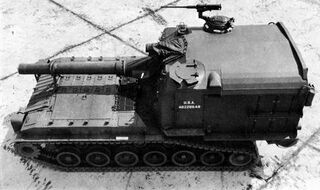 The prototype was produced in 1952, and in 1956 the SPG entered service in two variants: the M55 for the Army and the M53 for the Marines. 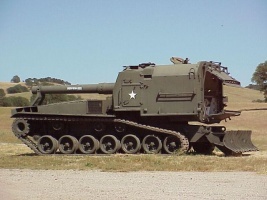 The M53/M55 is an unique vehicle in the American SPG branch. The most noticeable features are the turret and the mobility. The turret has an impressive gun arc of 60°, which helps aiming without moving the vehicle itself. The mobility is very good, having a high top speed and a nice power to weight ratio. This gives the M53/M55 the mobility to relocate, flee from danger or bring support where needed. Futhermore, the gun has a nice mixture of accuracy, reload, and alpha damage. 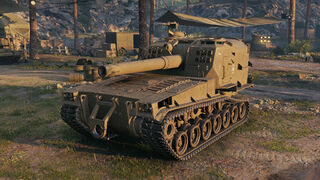 Also the gun has a good gun depression and elevation in comparison to the other SPG's. The main downsides of the M53/M55 is that it's quite large, which makes it easy to hit and having a bad camouflage. 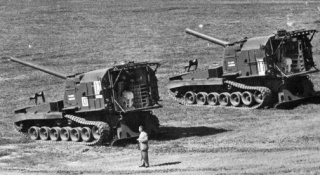 Another downside is when coming from the M40/M43, is that the radioman is replaced by a second gunner, resulting in breaking the Brothers in Arms perk. The M53/M55 leads to the T92 HMC. 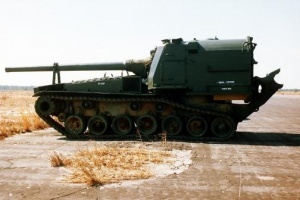 Gun range: stock: 1400 m, top: 1290 m.
Very wide firing arc; gun is mounted on a "pseudo-turret" much like the GW Panther. Very good speed, acceleration, and traverse, inferior only to French artillery. Good mix of accuracy, reload, and alpha, along with high shell arc on the upgraded gun. Poor alpha damage with the stock gun. It's only competitive against tier 8 and below. Large profile and horrific camouflage. Different Crew setup than the rest of the line (radioman replaced for a second gunner). 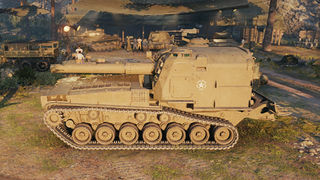 Initially, moving from the M40/M43 to the M53/M55 is very disappointing, as you have to re-research the 203mm howitzer, so stock you are a faster-reloading, more mobile M12. When fully upgraded, however, the M53/55 becomes a highly mobile, hard hitting artillery piece that is able to greatly influence the game. It has enough mobility to outrun some slower mediums and is able to easily re-position in order to fire on targets that are safe from other positions. 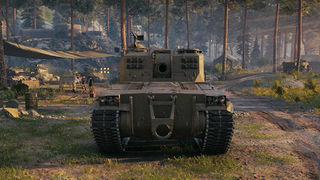 Due to it's outstanding all-around performance, the M53/55 sees use in Clan Wars over the T92, which was rendered obsolete by the Conqueror Gun Carriage. With the SPG rebalance, the stock gun is a viable alternative to the 203mm. While it features lower alpha damage and pen, the DPM is the same, and the improved rate of fire, aim time, and accuracy may help you keep targets tracked and stunned for longer, allowing your teammates to finish them off. The AN/PRC-25 radio is the only module to carry over from the M44. This page was last modified on 10 November 2018, at 21:31. This page has been accessed 120,872 times.